I'm generally an old fashioned, brick and mortar, kind of guy when it comes to buying watches. 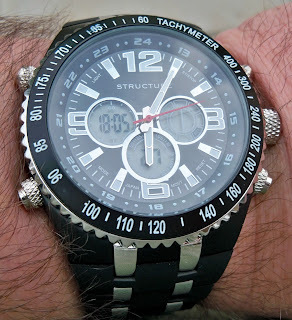 Most of my watches are bought on impulse when I am shopping for other things. (O.K., O.K., I don't have much impulse control.) Consequently, my watch boxes are filled with affordable watches that I think look cool. Since I get my watches on impulse, they tend to come from the places I shop: Kmart, Kohl's, Sears, Target, and Walmart. The Watch Department: Good Buys in Men's Watches at Kohl's. Good luck and happy hunting this holiday season! Black Friday is here and, if you can read this, you have already overslept! But, you it looks like there are some great Black Friday deals on watches this year. On Wednesday night, we visited a local Walmart and the excitement was palpable. The store was ready! One of the coolest watch merchandising displays that I've seen this year was this Walmart Christmas tree decorated with Atlanta Falcons watches! 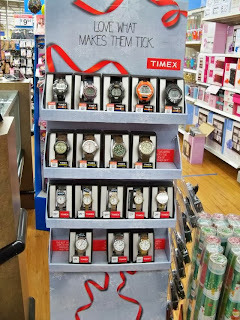 Our local Walmart has been particularly well stocked with very nice Timex products. 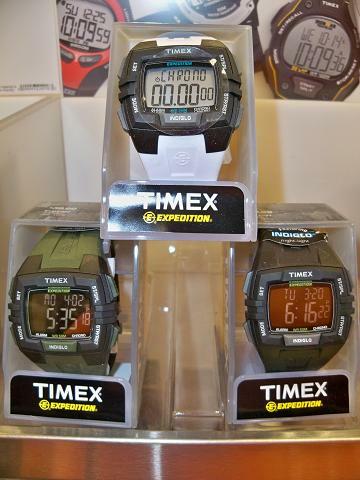 They have a variety of military-style Timex watches at attractive price points. Many Timex Expedition watches can be found for as low as $32. 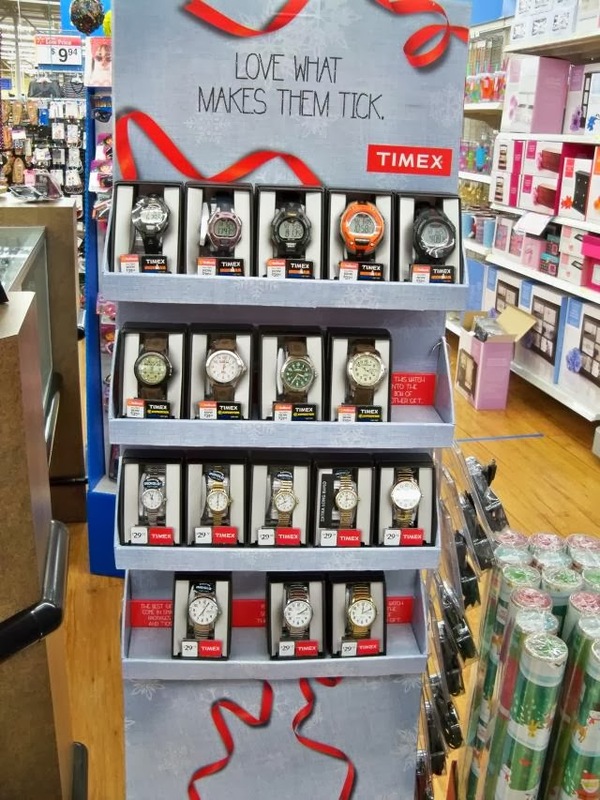 Our local Walmart had a nice Timex floor display as well. The leading watch brands at our local Walmart seem to be Armitron, Casio, Elgin, Marc Ecko, and Timex. They seem to be pretty well loaded with merchandise and associates were hustling to bring more to the floor in all categories. This year Walmart was open starting Thursday (Thanksgiving) evening and the associates were going to get an extra Holiday pay differential. Timex has 30 to 50% off through Cyber Monday using the coupon code "SAVE30" on Timex.com. Standard shipping is $1! Orient watches has 40% off watches at orientwatchusa.com using the coupon code "blackfriday". You also get an Orient-brand towel and free standard shipping. 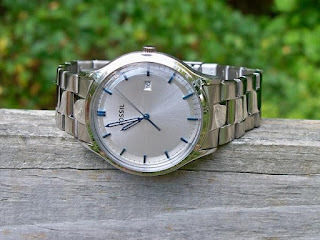 I've seen quite a few Orient watches on mywristwatch.net and they all look good. If you are on the WorldofWatches.com mailing list, they have some good deals as well. 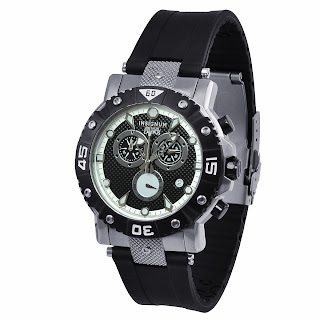 Diesel Timeframes offers - Shop Diesel Watches & Enjoy Free Overnight Shipping Thanksgiving Through Cyber Monday Only! I also noticed that Kohls.com has some great deals including a Bulova Marine Star in Black Stainless Steel for only $99. That's awesome! My friends at ZuluTimeZone.com are also offering some great deals this year with especially good prices on Android and Insignum products. Happy Thanksgiving! By now you are probably finishing your turkey and getting ready for Christmas shopping. 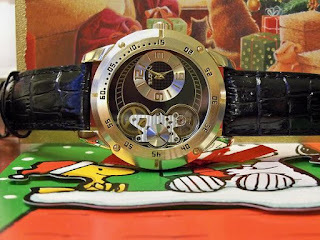 If you are shopping for a watch this Holiday Season, it is easy to succumb to the lure of the television shopping networks and their non-stop infomercials about watches. 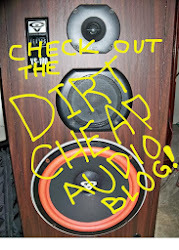 They are often fun to watch and you can find some truly great deals. However, everyone knows about them. Every watch collector has an Invicta or two or three. One very cool watch brand is AVI-8. They make watches inspired by aviation history. 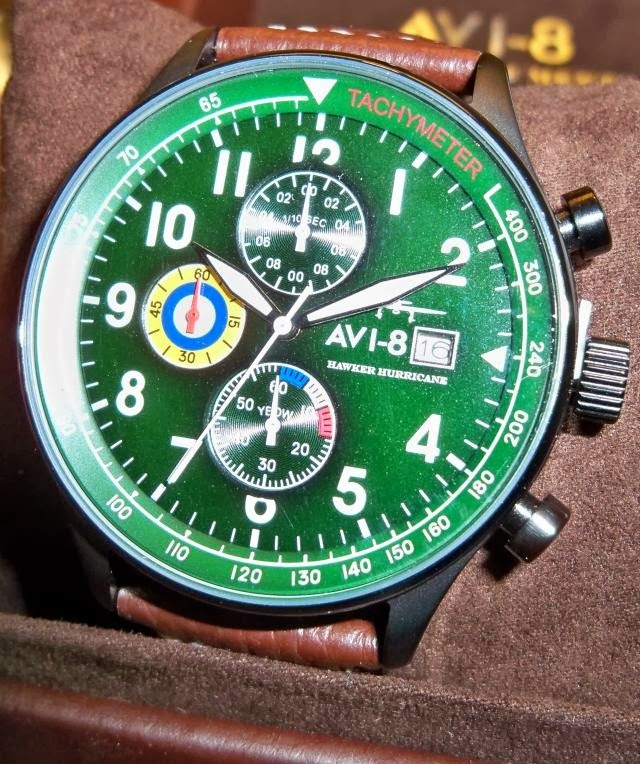 This is the AVI-8 Hawker Hurricane. Inspired by the fighter planes that saved the United Kingdom from Hitler's Luftwaffe, this Hurricane watch captures the colors of the original aircraft. It features a aircraft silhouette on the front and a line drawing of the famed fighter on the back. The complete AVI-8 line of watches has just been brought to Amazon.com where they are priced very reasonably with many priced under $100. Watches can't be more different in personality than AVI-8 and Modify. 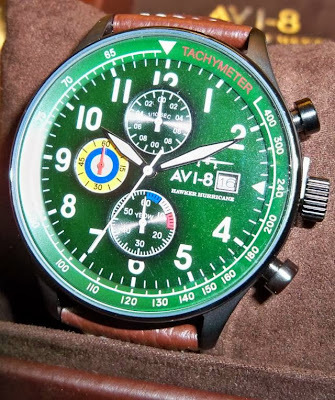 This alternative watch takes you from the stiff upper lip of the indomitable British pilots to the relentless techno beats of Atlanta night clubs. 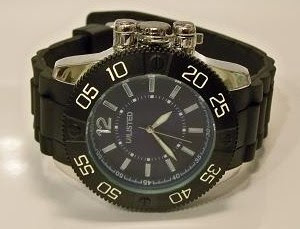 Modify watches have interchangeable faces and straps. You can mix and match until you perfectly match your wardrobe. They bring a young, fresh, vibe to the world of horology! From the night clubs of America it's another big leap to the precise designs of Germany's Insignum brand. As American supplies dwindle, the Insignum mix of German design and Asian sourcing is sure to become rare. Insignums like this Insignum Campus are still available at ZuluTimeZone.com. Finally, if you demand uncompromising performance from your watch, you might want to check out NFW watches at ZuluTimeZone.com. A Zoo York Watch from Kohl's. The Zoo York line of watches is available for around $30 per watch at Kohl's. They look like the perfect watch for the skateboarder on your list. 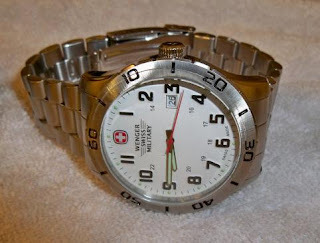 We skipped right over V to get to one of the coolest watches in my collection: The Wenger Swiss Military Grenadier Quartz Watch. For most people, the Swiss Military is synonymous with little red pocket knives. However, I remember visiting Switzerland as a young child in the 1970s. The train stations were filled with men in camouflage carrying very large assault rifles. It was the real Swiss Army. If you are on a super tight budget or just want to give an inexpensive watch as a stocking stuffer, you might check out the Thre3 brand watches at Kmart. Thre3 is a brand of the U.S. Polo Association and they look classier than their low price tag might suggest. I have two Thre3 brand watches and like both of them. The first one I bought was this sporty Ana-digital Watch. I don't even bother with the digital functions. It's just that the watch itself has an almost perfect racing watch look. The second Thre3 brand watch was a straight forward analog affair with very readable markings and a slightly racy look. While these watches only cost $20 to $30, they look far better than their low price tag would suggest. If you are looking for an extra stocking stuffer gift this Christmas or just need a watch to fit within your gift buying budget, Thre3 brand watches might be a good addition to your shopping list. 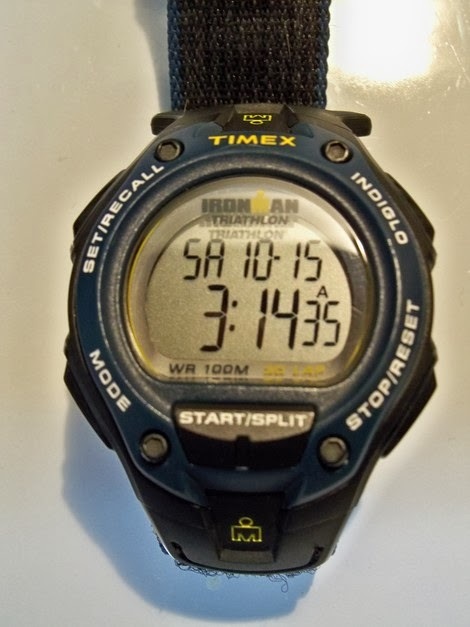 In my collection, T stands proudly for Timex! I love my Timex watches. They are affordable and they look good. The Timex watches at my local Walmart have never looked better. Timex is all over the trend towards military style watches. 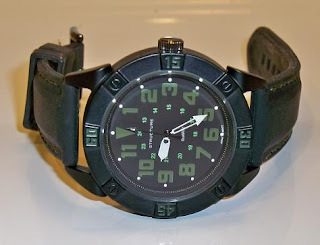 They have several military watches that simply look great. My favorite is this "Vintage Metal" Timex. It looks like something right out of World War II. Of course, if we would have had Indiglo technology in the 40s fascism would have been defeated far sooner. If you have a fitness fanatic on your gift list this year, the Timex Ironman line of watches might make the perfect gift. They look good and have all the stopwatch timer functions that you could ever want. Timex makes watches that simply work. They are readable, practical, and well designed. S sometimes stands for Structure. Brick and mortar stores still hold interesting watch finds. 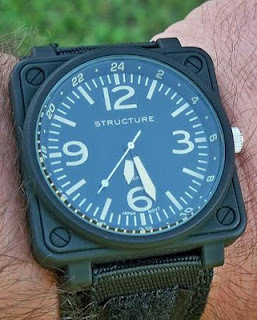 For example, I really like the Structure brand watches that I find at Sears. They only cost around $30 and they look really good. In terms of design, Structure brand watches are usually on trend. If you've been longing for a real Bell & Ross Instrument Panel Style watch, this Structure watch can satisfy your appetite. These Structure band watches are nice looking and priced right. They make great stocking stuffers! S is for Seiko. 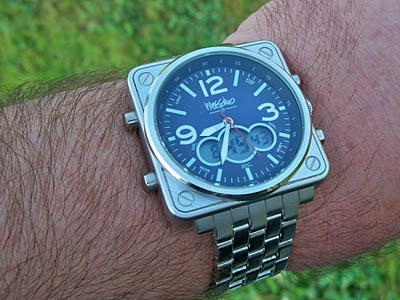 Some of the best and most meaningful watches in my personal collection are from Seiko. The Japanese giant makes accurate, reliable, and stylish watches. Seiko watches make wonderful Christmas gifts due to the companies reputation for quality and value. I received this Seiko Watch over 20 years ago to commemorate my graduation from the University of Florida. It's still one of the best watches in my collection. Relic is one of my favorite watch brands. This Fossil brand consistently delivers high quality quartz watches at affordable prices. 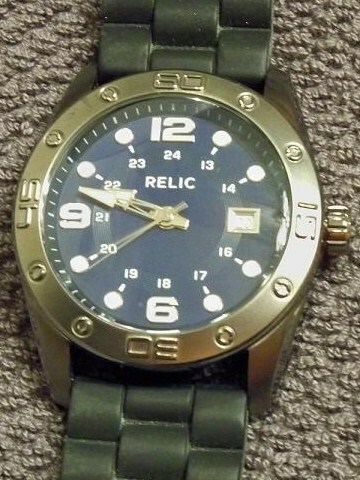 Relic brand watches have all the style and functionality of more expensive watch brands. But, they cost from $50 to $125 where a more expensive watch brand would easily cost from $100 to $300. This Relic "Detroit" was a little over $50, but it has a dark mysterious look that I like a lot. Christmas shoppers will find that Relic watches can fit many different personal styles. If you want to give a more proper dress watch, this stainless steel multi-function watch is perfect. 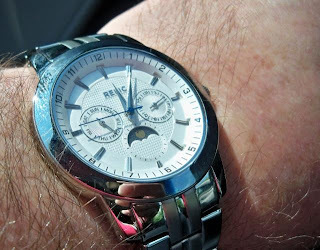 It even has a complication that shows the sun or moon depending on the time of day. 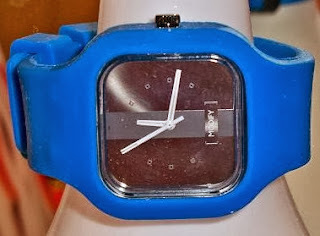 This Relic "Brady" watch (below) looks like a million bucks, but is quite reasonably price. With rich rose gold tones, it has the dignity of a much more expensive gift. N doesn't stand for Nautica in my watch collection. I don't own a Nautica watch. But, I've had a change to look closely at a couple of Nautica models. One of my co-workers has a two Nautica watches and they look great. 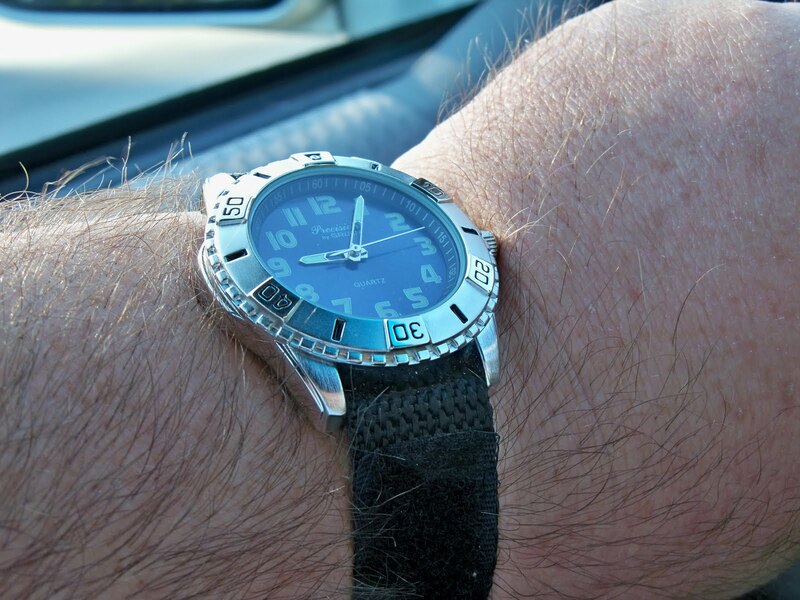 The dial is big, but not overly bulky and the materials used simply look good and seem very durable. I like the Nautica shown below because it has nautical flags to mark each position of the clock. To me, a nautical theme really fits the Nautica brand and makes the watch look very distinctive. I would own one of these watches in an instant. But, unfortunately, I don't want to be a watch copycat. I won't own a Nautica until I go work somewhere else! If you'd like to purchase a Nautica watch for a loved one this Christmas, check out the Amazon deal below. That price appears to be about $100 less than the typical prestigious department store price. Wow! I found a great deal! 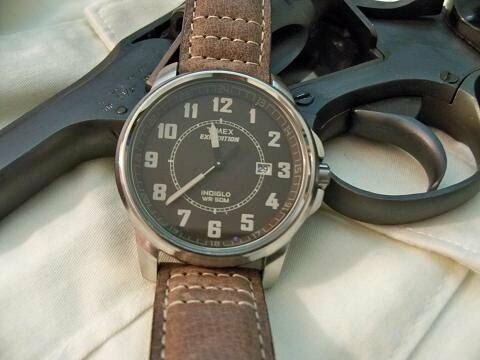 In my humble watch collection, M sometimes stands for Mossimo. Mossimo makes lots of watches for the American department store Target. 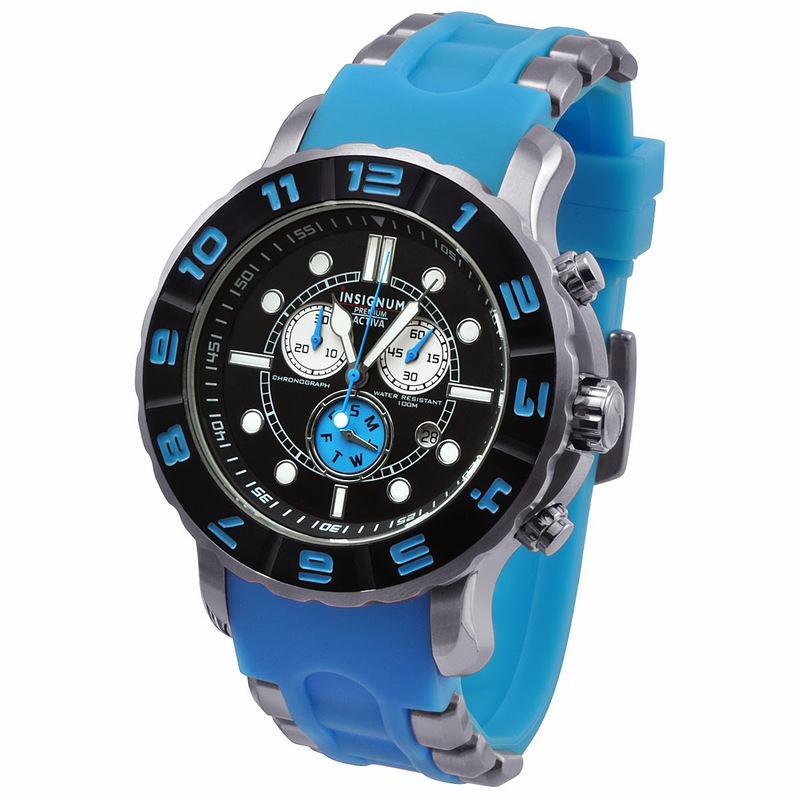 Mossimo watches are trendy and affordable. They usually cost between $20 and $30. If they have a drawback, I'd say that many Mossimo watches are derivative in their styling and take styling cues from bolder iconic watch brands like Audemars Piguet, Bell & Ross, and Diesel. 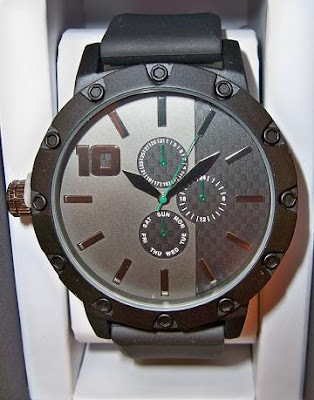 Mossimo watches are a great way to get some style on your wrist. They'd make a great stocking stuffer gift this Christmas. M is for Modify. If you are looking for something with a fresh, youthful, approach to timekeeping, you might try Modify watches. The company makes inexpensive square watches with interchangeable faces and rubber bands. 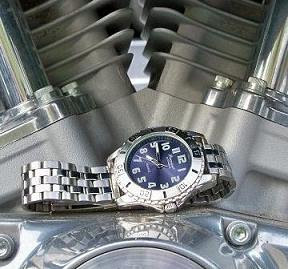 You can combine your watch components into the perfect watch to fit your mood and fashion sense. These watches are "dope." In 1987, these watches would have been called "fresh." Before that, they would have been called "killer." No matter what you call them, Modify watches are a novel and an interesting way bring younger people into the watch collecting hobby. In my collection, M sometimes stands for Marc Ecko watches. Marc Ecko got his start as a graffiti artist in the New York City area. He was also one of the founders of Zoo York. 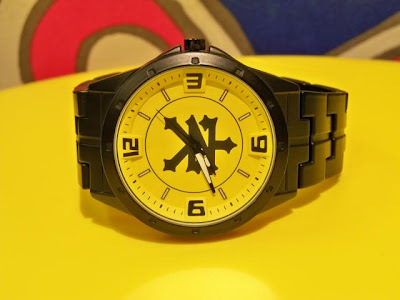 He brings his design genius to watches with the Marc Ecko brand in collaboration with Timex. The result is a reliable watch with an exciting urban design. Many Marc Ecko watches feature a Rhino motif to bring attention to one of Africa's most endangered species. I recently saw this Marc Ecko watch at a T.J. Maxx store for $49. This one features an interesting design approach to sub-dials. 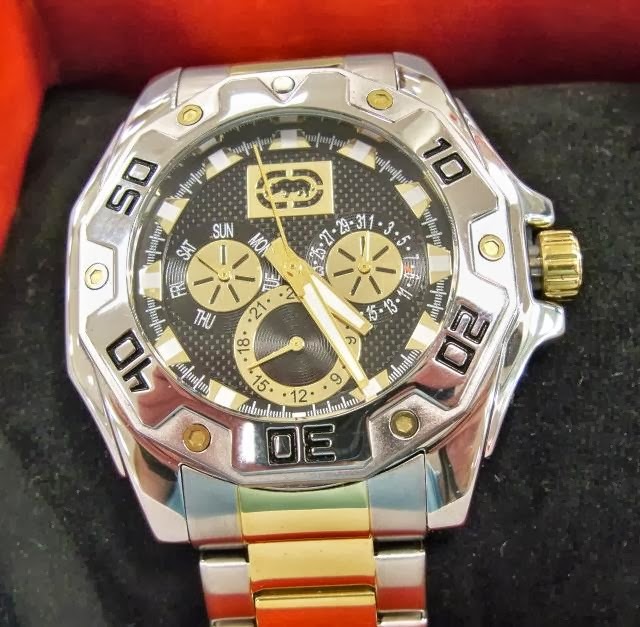 You can find Marc Ecko watches at several retailers including Walmart and Kohls. I find that the ones at Kohl's are a little more refined than the "blingy" ones at Walmart. 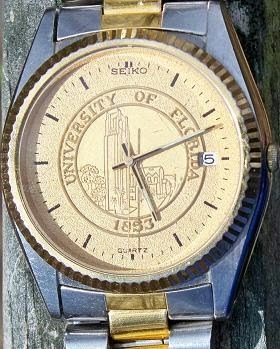 I've selected a few Marc Ecko watches from Amazon.com that I think demonstrate his sense of style. In my collection, L is for Lorus. If you are looking for something a little different, you might try a Lorus watch. 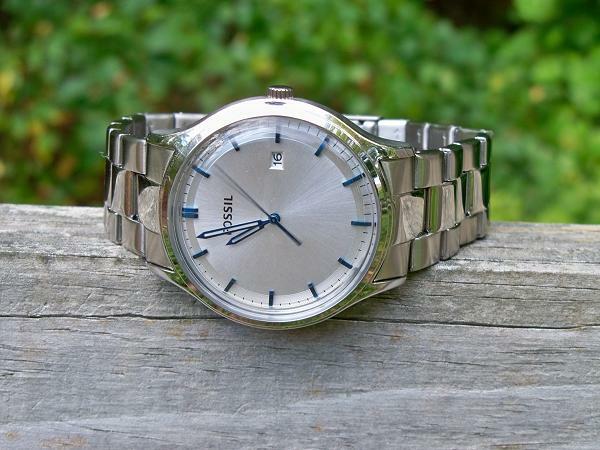 Lorus is a Seiko brand that it marketed in Canada, Europe, and the Pacific. 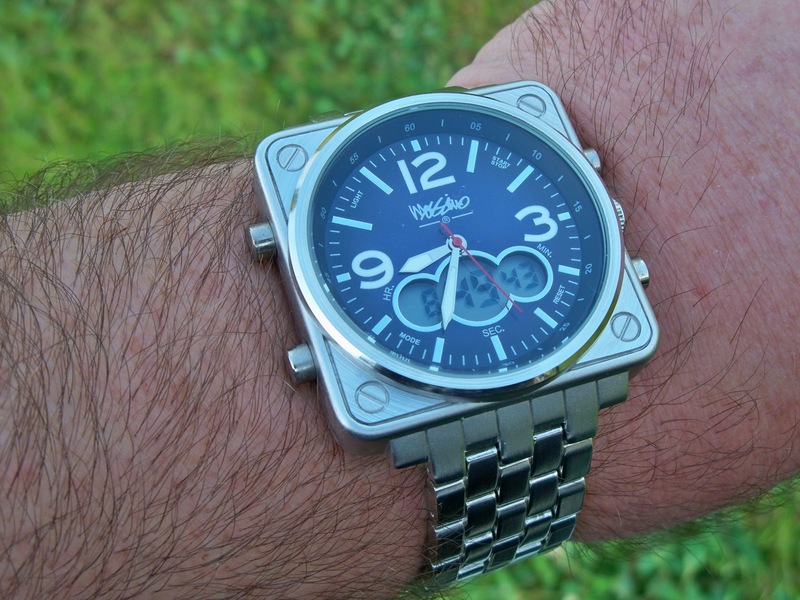 You can expect Seiko quality movements in a wide variety of designs. 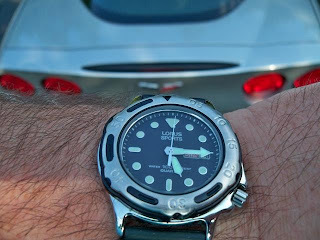 Lorus watches are also available at reasonable price points. 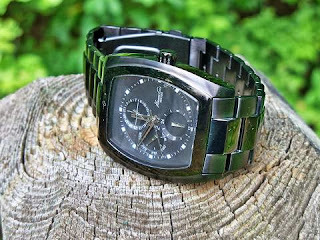 When it comes to my collection watches, K is for Kenneth as in Kenneth Cole! I have one Kenneth Cole watch and it looks great! It has a rectangular face and functional subdials. It also has enough lume to be readable. In my collection, "I" stands for Insignum. 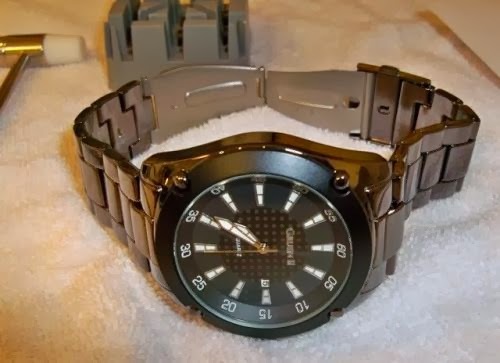 If you are looking for something a little different from the watches that are so commonly advertised in late night infomercials, you might see if you can find a watch from Germany's Insignum brand. An Insignum watch would make an unusual and unexpected Christmas Gift for the watch enthusiast. Unfortunately, supplies of Insignum watches in the U.S. are dwindling. The company makes a number of attractive sport and dive models. For example, the Insignum Activa 3-Eye'd Black Blue Sports Chronograph shown below is waterproof to 100 meters and shows the day and date. 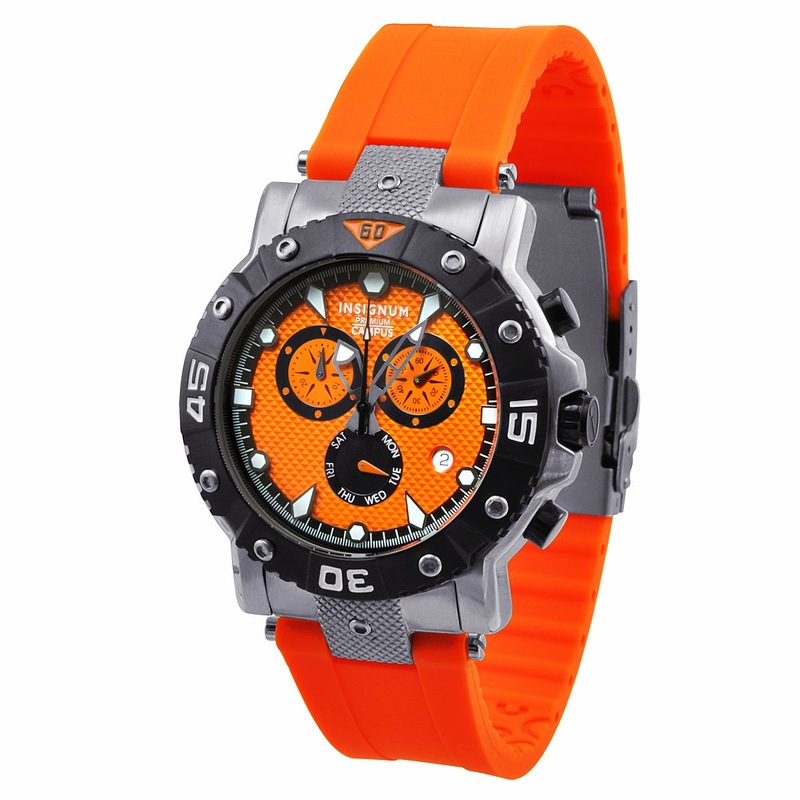 Insignum watches are offered in a wide variety of colors such as shown in this orange Campus Date, Day, Chronograph watch. These watches can be as bold as you want to be. While I love the more creative Insignum designs, I was also drawn to their classic diver style watches. For example, this Insignum Subwave is a fantastic looking watch. With 200 meter water resistance and a screw down crown, it has the fortitude for any underwater mission. 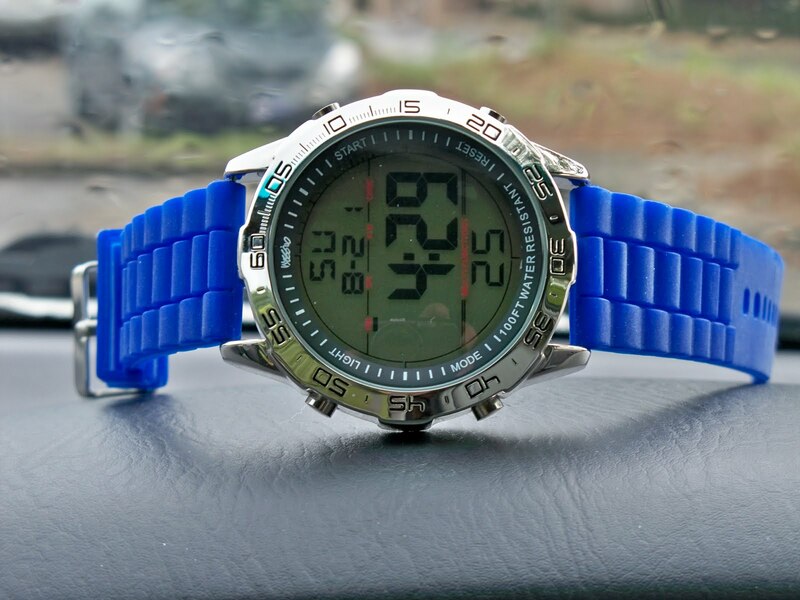 Since I didn't have a real dive watch, when ZuluTimeZone.com offered me a chance at a Subwave I jumped at it. The Subwave is a 48 mm diameter watch so it brings a little heft to the wrist. Unfortunately, Insignum watches are now in short supply here in America. 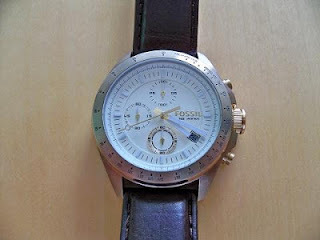 If you'd like to buy an Insignum watches, your best online source is ZuluTimeZone.com. Since these watches are becoming rather rare here, you may find yourself with a rather exclusive timepiece. As my parade of Christmas watch ideas continues, H is for Hamlin. 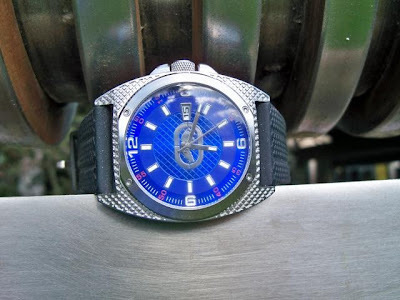 Hamlin is another fine American brand that has been revived to sell contemporary watches. However, the current Hamlin brand does retain some design continuity with antique Hamlin watches. My Hamlin Ultra Thin Men's watch with mesh bracelet looks like something from the 1930s. In my collection, G is often for Gruen II. Gruen was another fine name in American watches. They manufactured watches from the 1890s through the 1950s. Ebay has lots of vintage Gruen watches at a variety of price points. These vintage watches could make memorable and meaningful gifts. Like the Elgin name, the Gruen name has been revived by MZ Berger. While these new Gruen's are certainly less desirable from a collector's perspective. You could still find some nice contemporary watches from these new Gruen collections. But don't be fooled into thinking that new Gruen watches are valuable because of the Gruen name. At Kohl's I purchased a "Precision by Gruen Watch" for about $23. It came with a really cheap nylon band, but looks very nice with this replacement bracelet. I have also bought a Gruen II watch at Sears. 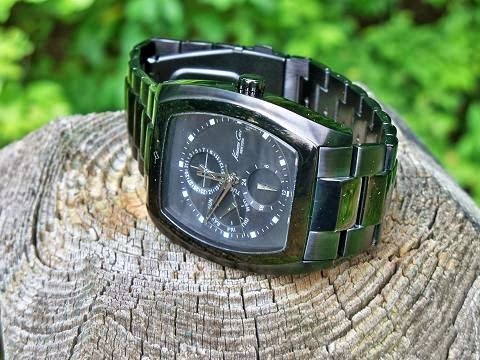 It's an attractive looking quartz watch for about $35. It was a little too large for me, but I was easily able to resize it using the Android watch repair kit that I won from a contest on one of my favorite watch forums. These new Gruen watches would be perfectly reasonable gifts if you are shopping in the under $50 price range. They'd be great stocking stuffers. My Gruen II watch also came in an attractive box. That's always a nice plus for Christmas shoppers. 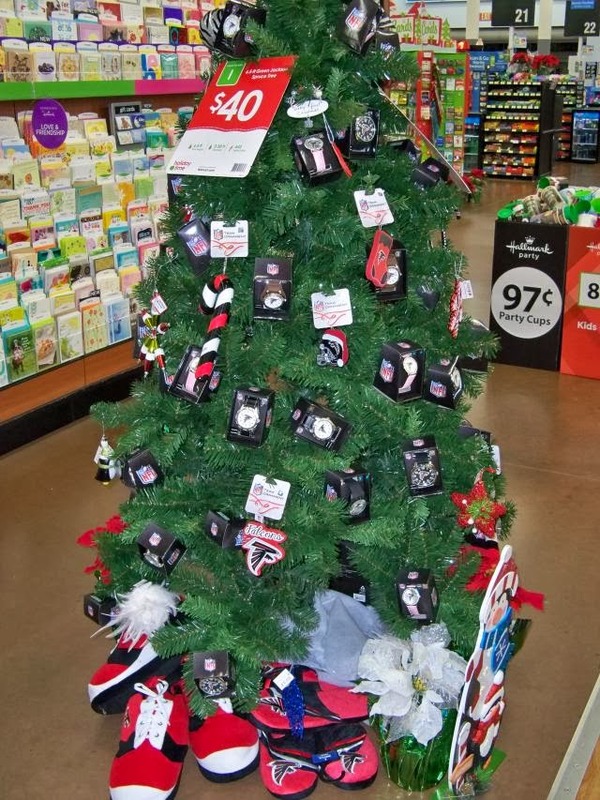 If you have a sports fan on your shopping list, G might stand for Gametime. 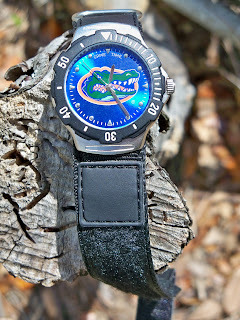 I enjoy my Gametime Team Watch every year for college football season. F is for Fossil in my collection. If you want to see a lot of great watches in one place, find out if there is a Fossil Outlet at your nearest outlet mall. You'll find lots of great watches at reasonable prices. Fossil watches make great Christmas gifts. I have two really cool Fossil watches in my collection. The first is a classic retro design call the Fossil Ansel. It looks like a watch from 70s with more contemporary dimensions. My second Fossil watch is the Fossil Decker. It looks like a vintage bronze watch that is fit for a sea captain. It's a classic look. It makes a great gift because it has a rich character. The Elgin name has been revived by MZ Berger. However, modern Elgin watches have no relation to the original company. 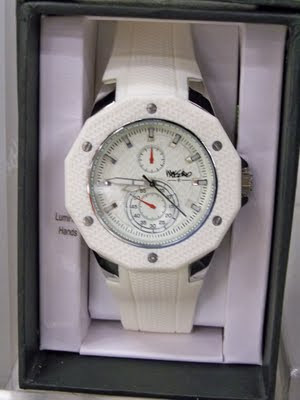 But, MZ Berger does make stylish, affordable, watches that can make appealing gifts. I bought this modern day Elgin at Sears and it is one of the most attractive and unusual watches in my collection. Here is a similar design for a great price!